The next set of graphs comes from "Tiger moms and helicopter parents: The economics of parenting style" by Matthias Doepke and Fabrizio Zilibotti, as featured on Voxeu (not the same as Vox.com). The authors explore why different parenting styles arise and how the styles differ around the world. So-called "tiger moms" and "helicopter parents" are a common subject of discussion, there are lots of stories of parents trying to attend job interviews with their children or go to their college classes. Ridiculous, right? Why would a parent ever behave this way instead of letting their children be? Doepke and Zilibotti say that these parents are motivated by the knowledge that their children's success and later lifestyle is highly contingent upon job and educational performance. Naturally, this isn't the case in every country - in countries with higher inequality, the performance of an individual in education and early career is much more important. Duly, they have plotted the emphasis upon values reflective of certain parenting styles in different countries against inequality as measured by the Gini coefficient. "The return to pushing children hard consists of the increased likelihood that they will do well later in life. How important this is to parents depends crucially on the degree of economic inequality, and in particular on the return to education. In an economy where education and effort are highly rewarded and where people with little education struggle, parents will be highly motivated to push their children hard. Thus, we expect economic inequality to be associated with intensive (authoritarian and authoritative) parenting styles. 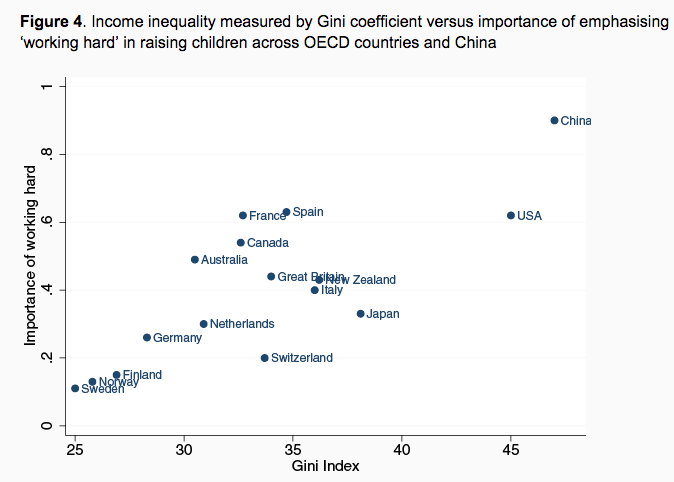 In these graphs, you can see a clear trend between inequality and emphasis on relaxed or very strict parenting ideals. In the US, which has high inequality, parents are much more focused on authoritative parenting to ensure success. One thing's for sure: I've never heard of a tiger mom in Sweden. This is probably best, as it's been found that this style of parenting actually leads to lower self esteem and worse grades for the children. So we've already seen how various countries' inequality affects parenting style, but how does country income affect ones' view on success? FiveThirtyEight has repurposed the data from a Pew report into these lovely graphs that show how different countries view the factors of success. It shouldn't be surprising that in countries with lots of corruption, bad economies, and rampant nepotism, people think success is out of their hands. It is also unsurprising that the US sees success as being within our individual control and due to hard work, as that is the entire foundation of the traditional "American Dream" ethos. The data is then separated into analysis of the determinants of success. The countries where "Who you know" is considered very important are logically those in which many lucrative jobs will be filled via nepotism (definition: "the practice among those with power or influence of favoring relatives or friends, especially by giving them jobs"). In these economies (Nicaragua, Ghana, Pakistan, Senegal, Uganda, etc.) not a lot of high-paying or prestigious jobs exist, so it's logical to assume a successful parent will try and procure their child or friend a job in their company or field rather than throwing them to the metaphorical wolves. It's also interesting to see where "being a man" and "being lucky" are considered important. My purely speculative thought is that "being lucky" probably correlates with the countries that are more religious, and view success as something that is bestowed upon you from the heavens rather than reflective of hard work. Many of these undeveloped economies are full of extremely hard workers doing back-breaking labor to get by, so it's natural they would think that hard work doesn't ensure success - after all, in a lot of places, it doesn't! If there aren't any good jobs available, it doesn't matter how hard you work, because you still can't get a job that doesn't exist! Last but not least, what do economists think about what Piketty had to say? For those of you who don't remember, he released "Capital in the 21st Century", a highly controversial and acclaimed text with the core theory that the wealthy will keep getting richer due to the growth rate on their existing capital being greater than the economic growth rate. Here's a 4-paragraph summary of the book from the Economist, if you're interested.